An August 2013 study via Twitter showed that 72% of participants were more likely to make a purchase based on brands they follow and engage with on Twitter. Additionally, 86% of participants were more likely to recommend the brand if it is recommended by a friend. Yesterday, Twitter announced new developments coming to promotional accounts. Promoted accounts began in 2010 and previously showed up in the “Who to Follow” section. Now, promoted accounts will be in your news feed too. Adding Promoted Accounts to the news feed is ideal for advertisers, as they can seamlessly integrate their ads into a reader’s account using a call-to-action phrase. Restaurants and brands will be able to include geo-targeting (targeting to a specific location) within the campaign, reaching the users they feel will find their information most valuable. The Promoted Accounts in the ‘Who To Follow’ sidebar will continue to be an option as well. Because 76% of users access Twitter via mobile devices – where Twitter is unable to display the ‘Who to Follow’ section, this new development will be crucial to reaching mobile users during a promotional campaign. 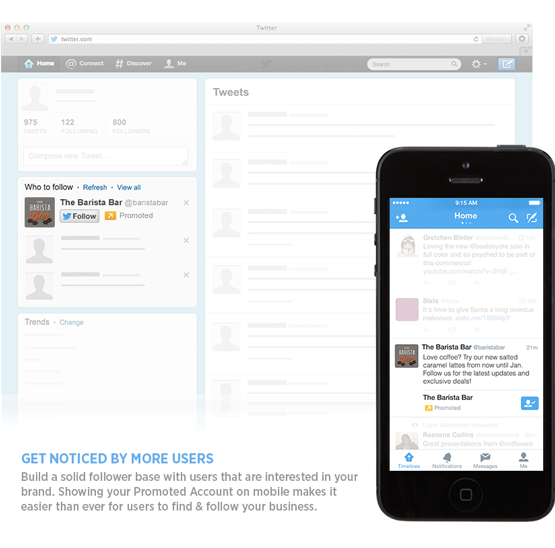 So, will you hop onboard with a new Promoted Accounts campaign?